Ever wondered how Tabo would look like performing a Lion Dance? Well here’s your chance to see it, courtesy of sweet_strawberries96 Chinese New Year video. Happy Chinese New Year (*blows horn*)!!! I hope everyone will have a great year ahead. To celebrate the Chinese New Year, here’s a video entry from Nanao chan featuring some martial arts performance and a lion dance. Enjoy! 3. Watch out for the updates in Director’s Club to see if your videos make the cut! Hope you all have a prosperous year ahead of you! Ever wondered about the story behind Hello Kitty Online? Satisfy your curiosity with this video. Hi folks! Here are the winners of the HKO Trailer Contest, which was concluded last June 30th, at exactly midnight, Hong Kong time! Congratulations to the winners! As always, we will be emailing you the directions of how to claim your prizes and how they will be sent to you. Thanks to everybody who joined the contest, and we look forward to seeing you guys again in future Dream Studio contests! That’s right folks; it’s the first of July, and last night was the deadline for all entries to the HKO Trailer Contest. Which only goes to follow that any entries submitted past twelve midnight this morning will not be accepted. Thanks to everybody who sent in a video! Despite the strict requirements we had for the competition, we still have a pretty good list of entries that aren’t just good - they’re actually pretty impressive! All winners will be announced on SanrioTown on July 18, 2008, so stay tuned til then. Good luck to everybody who joined! Hi folks! We’re in the last week of June, which pretty much means that time’s running out for anybody and everybody who wants to enter the HKO trailer competition. The response has been pretty good, and as was stated in the last post, we’ve seen some pretty good entries from people who’ve tested the game itself to people who wanted to (but weren’t able to, unfortunately). But just because we’ve got a pretty good list of entries now doesn’t mean that it should stop you from sending in your own work! You’ve still got some time, so get crackin’ on those videos and wow us all here at SanrioTown with your artistic prowess! So remember: you’ve got up to midnight of June 30, 2008, which is technically next week, to send in your entries. You have to use all of the elements found in the trailer pack provided, but everything else is pretty much up to you. Just make sure to come up with the best trailer you can imagine! Hi everybody! We’re nearly at the end of May, and so far, we’ve seen some pretty good entries in the HKO trailer contest. As a matter of fact, you guys have been doing such a great job that we’ll be featuring some of your masterpieces here in Director’s Club! And here we have an impressive trailer that looks like it used nothing more than Dream Studio’s own features and special effects. This trailer was made by hkotest251, who seems to be a beta tester for HKO as well. That’s all for now. Stay tuned for more exciting samples as we enter the second month of the contest! Hi folks! It’s (technically) the first week of the HKO Trailer Contest, and already the entries have slowly but surely been popping up in Dream Studio. ALL of the elements provided in the HKO Contest media pack have to be used. You are not limited to using just those elements, but all of them have to appear in your submission. You must add the tagword "HKOContest" when you upload your video into Dream Studio. 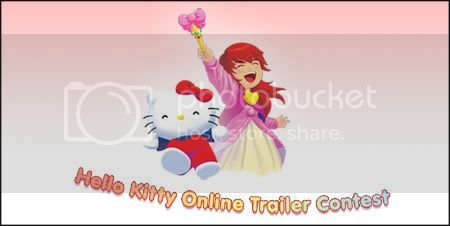 Any other tags, such as "contest HKO" or "Hello Kitty Online Contest" will not be considered an entry. Please be guided by these reminders accordingly, so that your entry can be easily processed by the competition officials. Thanks, and once again, good luck to everybody! We’d just like to remind everybody that all entries should contain no offensive material, nor should explicit / violent content be used. Each entry should contain all of the elements found in the HKO trailer media pack, and should contain the tag "HKOContest," otherwise these will be disqualified. Get Your Own SanrioTown Blog!